Oh when L.A.”—the song starts slowly, almost mournfully—”goes marching in…,” before the drums come crackling in and the song kicks up into a romp. It’s a Saturday morning, and 80 or so people—mostly Latino men—have gathered in Lot 6 of Exposition Park to support the city’s newest Major League Soccer team, the Los Angeles Football Club. Its home, the Banc of California Stadium, is under construction nearby. 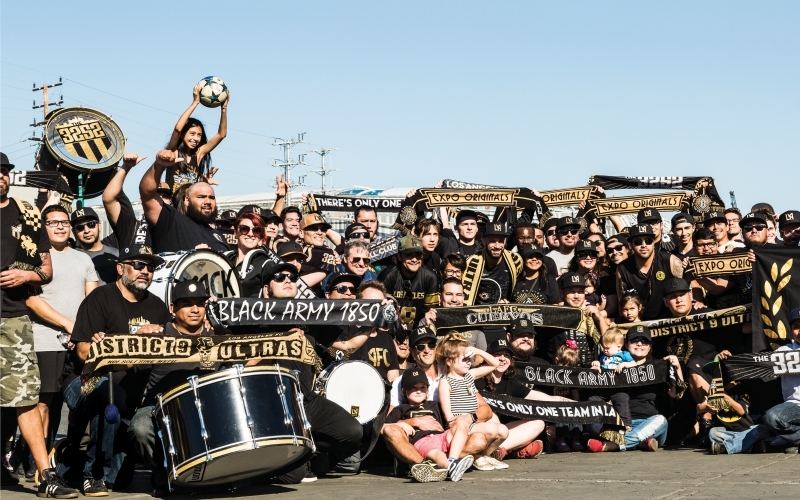 Almost everyone has a black-and-gold hat, scarf, or jacket featuring the team’s Art Deco logo as they sing tunes ranging from basic chants—“L.A. Football Club! La-la-la-la-la-la-la…”—to rewritten pop standards, as is the practice among football crowds in England (there is a surprising amount of singing in European football). Leading the chorus is Josue Villanueva (or Chiquilín, as he’s known), a rather large, bearded 22-year-old with a beaming smile. An L.A. native, he’s a diehard Pittsburgh Steelers fan. Like many Americans, he was introduced to professional soccer by watching the World Cup on TV. Like many Angelenos, he was rooting for El Tri—Mexico, where his parents are from. And like others here, he was never comfortable rooting for the L.A.Galaxy, in part because they play in far-flung Carson, and in part because of the staid atmosphere at the matches there. 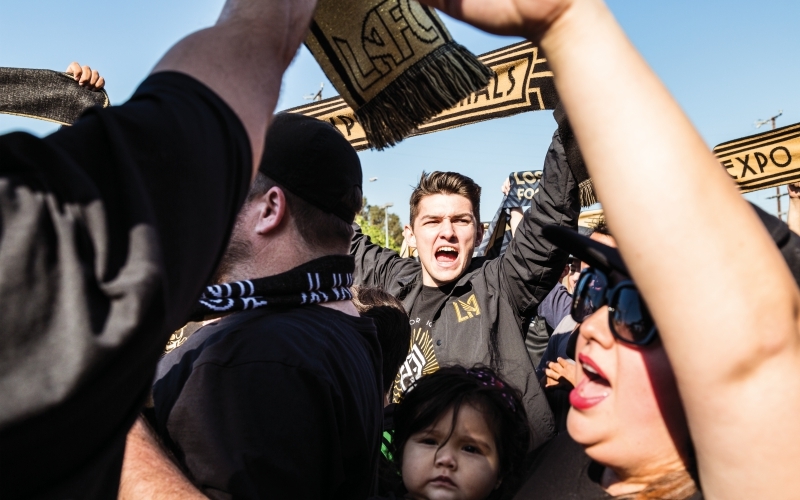 For Villanueva and others, LAFC is the chance to not just root for a team but also to help start one. “We call ourselves supporters,” he says. “But I feel like I’m part of the team.” In soccer, there are fans and there are supporters. Fans go to a game once in a while. Supporters, who often form clubs, or groups, go to every match and sing throughout, giving their team an edge—which in turn attracts more supporters and fans. LAFC suppoerter Fernando Valero (center) is ready. Judging from the infectious energy in Lot 6, you shouldn’t put it past them. When LAFC central defender Laurent Ciman drops by, he seems impressed. So does Steven Boll, a native of Dortmund who moved here three years ago. “This is incredible,” he says. Could L.A. ever be like Dortmund? “Maybe not in the numbers. Dortmund [F.C.] is over 100 years old. But…” he trails off, smiling, as the dwindling crowd breaks into another chant, jumping up and down and pumping fists. Next article5 Bowls of the Best Ramen in L.A.